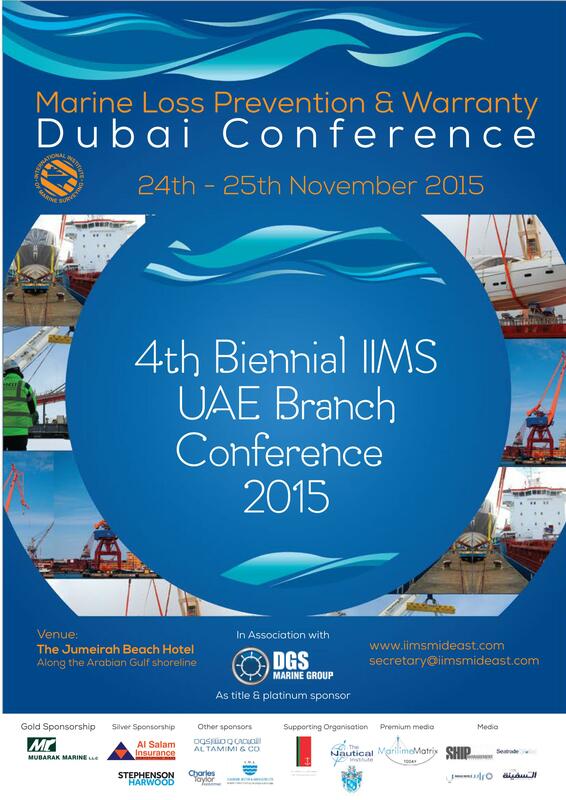 The 4th Biennial UAE Branch Conference entitled: “Marine loss, prevention and warranty”, (kindly sponsored by DGS Marine Group), was hailed a great success by all those who attended. Held at the stunning waterfront Jumeriah Beach Hotel conference venue and facility on 24/25 November, the quality and standard of presentations was very high indeed. As a consequence, the feedback forms showed a most positive response and high approval rating. Branch Chairman, Uday Moorthi, was generous in his praise for those who gave their time to ensure the success of the event. He particularly singled out the Branch Committee for their diligence and duty. At the Conference dinner on Tuesday evening, three awards were deservedly given to surveyors in UAE who had made a significant contribution. Sridath was presented with an award as ‘The most courteous surveyor in UAE’. Tammy Potter was given the ‘UAE lady surveyor of the year’ award’. Graham Ellis was given a ‘Lifetime Achievement Award’, which was accepted on his behalf by Pat Cannie, a previous winner of this accolade.